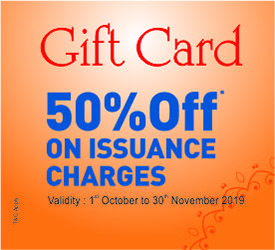 Gift Card - Saraswat Cooperative Bank Ltd.
Saraswat Bank Gift Card gives you flexibility to use your card at your convenience, anytime, anywhere. The Gift Card can be easily and securely used at any of the RuPay accepting merchant outlets. We have ensured that your Saraswat Bank Gift Card makes your shopping experience convenient and memorable. For your convenience the card will be activated within 24 hours from the time of purchase and will be ready for use. Saraswat Bank Gift Card works in the same way as a Debit does, for purchase transactions at merchant outlets or online, with the only difference being that you will be able to spend up to the amount loaded/ available in the card. Please sign on the reverse of the card to avoid any misuse.